"Paseando por el Retiro cayendo copos de nieve" (Walking through the Retiro by snow fall) by Mariangeles Sánchez Benimeli. Evokes a determinate walk, on a cold winter morning of December, in Madrid´s Retiro Park. The melody from its fountains is mixed with singed musical themes and “chotis” rhythm sounding on the background; as if they want to honour Madrid's city. On this particular winter morning, it is snowing in Retiro Park. Everything is contemplated and enjoyed with the soft touch of snowflakes falling down and glide them all over they found on their way. Dedicated to Cristina Rivas poetess and José Luis Ruiz del Puerto guitarist. 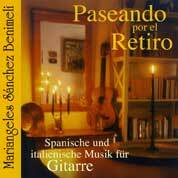 Premiere: “Epiphanienkirche-Charlottenburg-Berlin” in 2003 by Mariangeles Sánchez Benimeli.